Entergy New Orleans shows what its proposed 226 megawatt plant would look like. The company says the plant would also deal with a catastrophic transmission problem. 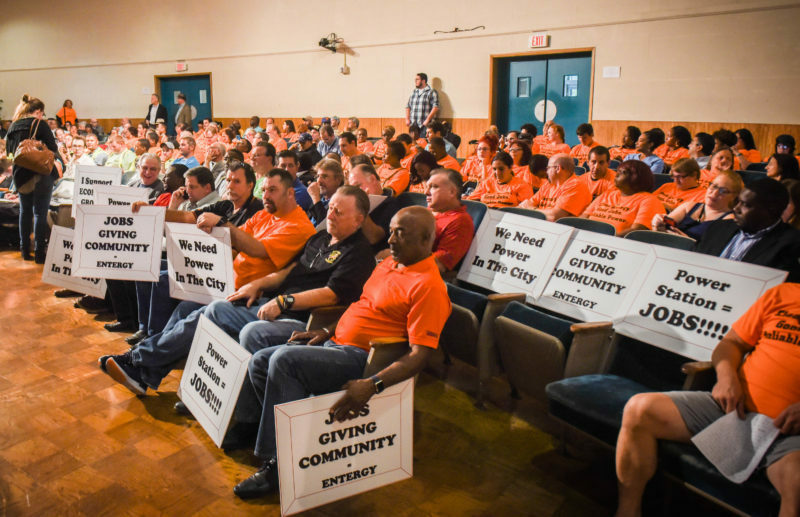 It was easy to tell who supported Entergy’s proposed power plant at a public hearing last fall; they were the ones wearing fluorescent orange shirts that read “Clean Energy. Good Jobs. Reliable Power.” Entergy wants to build a power plant to handle demand during periods of unusually high demand. Opponents say the company hasn’t examined alternatives. 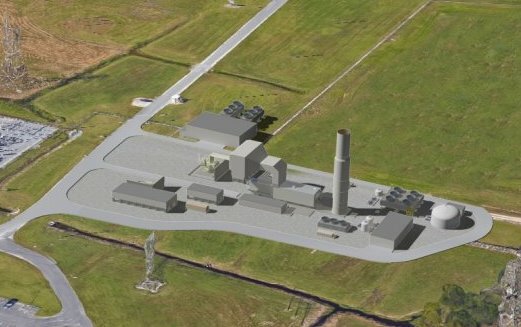 After nearly 19 months of debate, testimony and public meetings, the New Orleans City Council is poised to decide whether the local power company can build a controversial natural gas plant. Entergy New Orleans has offered three reasons the city needs the plant: It’s necessary to meet power needs during peak hours; it will improve transmission reliability; and it could jump-start the city’s power supply after a hurricane. But opponents and some experts say it’s expensive and superfluous. “Five years ago, this natural gas plant might have looked like a logical option,” said Jay Hakes, a New Orleans resident who led the U.S. Energy Information Administration from 1993 to 2000. Those options include generating power with solar panels and using batteries to store the electricity, as well as programs to reduce demand. Even if Entergy doesn’t pursue those options, opponents say it can find cheaper energy on the open market through a network of electricity grids stretching from Louisiana to Arkansas. These alternatives have worked elsewhere in the U.S. But no one can say for certain whether they would work here because they haven’t been studied. Neither the city council’s Utility Committee nor the consultants it hires for $7 million a year are conducting independent analyses, so the only detailed examination of New Orleans’ choices is coming from Entergy itself. Opponents of the plant say Entergy’s eagerness to build it is largely motivated by a generous incentive from the city and the fact that the company won’t bear any of the risk if the plant proves to be a bad investment. Entergy would pass along to its customers the cost to build, maintain and operate the plant, plus another 11 percent of the plant’s total cost as profit. The council’s utility committee is scheduled to vote Wednesday on Entergy’s application. Councilwoman Susan Guidry, who’s on the committee, said they should delay it because there hasn’t been enough exploration of alternatives to a new plant. Entergy has declined six interview requests from The Lens over the past four months. The other members of the utility committee — councilmembers James Gray II (who represents the district where the plant would be built), Jared Brossett and Stacy Head — did not immediately respond to requests for comment. Entergy applied in June 2016 for permission to build a $216 million, 226-megawatt power plant in eastern New Orleans. It would be built at the Michoud site, where Entergy decommissioned two turbines that month. The company said it would soon be unable to meet the city’s energy needs when demand is highest, usually on the hottest days of summer when everyone cranks up their air conditioning. Entergy New Orleans shows what its proposed 226 megawatt plant would look like. The company says the plant would protect against “cascading outages and blackouts” that would occur if a number of failures occurred at the same time. Opponents say the risk of such an event is extremely low, and it can be addressed with transmission upgrades. Its solution is a natural gas “peaking plant,” which would operate only during peak times — typically 10 to 15 percent of the year. Entergy has not publicly said how often it expects the plant to operate. That decision is up to the Mid-Continent Independent System Operator, which controls power generators across the central United States and Canada. Electricity produced by peaking plants tends to be more expensive, partly because they have to be turned on and off more frequently. Critics say such plants are increasingly unnecessary because of advancements in solar battery storage and programs to manage power demand. “Gas peaking power plants are the technology that will be obsolete next,” Bradley-Wright said. In January 2017, Entergy updated its forecast of peak energy demand, concluding that future demand was significantly lower than they thought. That was the second time in three years that it had lowered its forecasts. Even now, affordable energy advocates say the current projections are still inflated. “I don’t think we’re anywhere close to reaching the level where peak demand is greater than peak supply,” Hakes said. His wife, Anita Zervigon-Hakes, is president of the New Orleans Coalition, one of the groups fighting the plant. 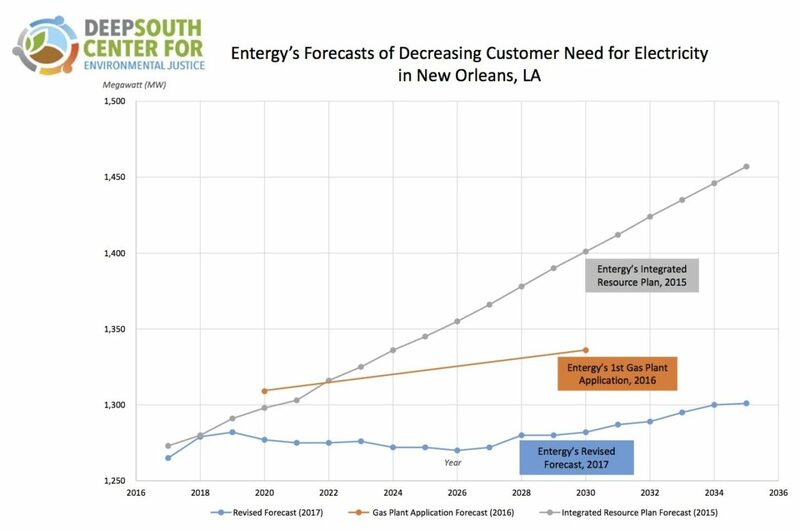 In this chart, the Deep South Center for Environmental Justice illustrates how Entergy has decreased its demand forecast every year from 2015 to 2017. The orange line shows the projections from the original 2016 application and the blue line represents the updated projections that pushed Entergy to withdraw its application and reapply in 2017. Entergy pulled its application in February 2017 to reassess whether the plant was needed. The company submitted a new application in July. It still recommended the 226 megawatt plant, but the price tag rose from $216 million to $232 million. It offered a smaller option, too: a 128 megawatt unit that would cost $210 million. The biggest change in the new application was the rationale for the plant. It still cited peak capacity shortfalls, but the company stressed reliability concerns. The closing of the two Michoud turbines, the company said in the application, has left the city vulnerable to disastrous transmission failures. A review by Mid-Continent Independent System Operator concluded that Entergy’s planned transmission upgrades would alleviate any major reliability concern stemming from the 2016 closure of the Michoud units. The “cascading outages and blackouts” that Entergy refers to would occur only if a number of mechanical failures occurred simultaneously during specific, high demand moments — a scenario that has never happened, Bradley-Wright said. Entergy has acknowledged it can protect against such a scenario with an estimated $57 million in transmission upgrades, but it said it hasn’t studied the matter in detail. In a recent appeal for public support, Entergy New Orleans CEO Charles Rice said the need for the new plant was demonstrated in 2017 by the tornado in eastern New Orleans and the summer thunderstorms that flooded the city. Fears about natural disasters and frustration with the city’s inability to prevent flooding have stoked public support for the plant. The company says a new plant would help restore electricity to the city in the aftermath of a hurricane. The smaller unit would have “black start” capability, which allows it to start up in the event that it’s cut off from the power grid. The larger plant, the one Entergy prefers, does not have this capability. Critics point out that the Michoud site is on low-lying land vulnerable to storm surge. During Hurricane Katrina, the old Michoud facility took on six feet of water and was offline for six months. And in the aftermath of a major hurricane, most of the distribution lines in the city — and perhaps transmission lines — would be down anyway. “I think Entergy has been a bit unclear about what the problem is they’re trying to solve,” Hakes said. Although opponents disagree that New Orleans urgently needs another plant, they acknowledge the city must prepare for when Entergy’s decades-old coal and natural gas plants are decommissioned. Renewable energy proponents argue that solar is an increasingly attractive option because battery storage has become so much cheaper and reliable in the past few years. This allows utilities to deal with the major drawback of solar energy — it only works when the sun is shining. The installation of solar battery storage has boomed in the U.S. since 2015. Just this month, utilities in Florida and Arizona opted to install solar battery storage to meet peak generating needs. The technology is new, which brings uncertainties. But Hakes said New Orleans shouldn’t shy away from what he sees as the cutting edge of utility technology. Entergy New Orleans has committed to installing 100 megawatts of solar power — about 10 percent of its generating capacity. One megawatt is up and running. The cheapest way to provide enough power during unusually high periods of demand, opponents argue, is by reducing energy use and waste. According to a study by the American Council for an Energy Efficient Economy, New Orleans ranked 49th out of 51 cities in terms of energy and water utility efficiency. That’s one reason Louisiana uses more energy per capita than any other state, and why New Orleans households spend more of their income on energy than residents in all but three major cities in the U.S. That’s in spite of the fact that Entergy’s per-kilowatt hour rate is one of the lowest in the country. Navigant, a consultant hired by Entergy, concluded that the city could reduce its energy load by roughly 17 percent over the next 20 years through energy efficiency measures. Along with with capturing wasted energy year round, some utilities have created programs to reduce demand at peak hours. “We already know that demand response, which is basically is asking customers to use less when it’s important, is capable of reducing peak usage easily by 5 or 10 percent,” Stanton said at the hearing. Entergy’s critics say it has been slow to implement these programs. “I don’t see any viable effort they’re making to move demand off of peak time,” Hakes said. After repeated urging from the city council, Entergy implemented a demand-side management program called Energy Smart EasyCool in 2017. Hakes said the lack of publicity has limited its success. Opponents say Entergy has failed to include these alternatives when projecting future demand, even when told to by the city council. The company doesn’t have much of a financial incentive to pursue energy efficiency and reduce demand; both would result in reduced sales and less profit. The incentives to build a new power plant, on the other hand, are strong. The company’s 11 percent return, guaranteed through its agreement with the city, is one of the highest in the country, Bradley-Wright said. Hakes said the council should reconsider the incentives it offers Entergy. “You want to create a system where they would get a return on investments for energy efficiency, not just building new plants,” he said. In its application for the plant, Entergy said these alternatives cannot satisfy the city’s long term power deficit at peak hours. The council’s utility committee held a hearing in December to decide what testimony would be passed on to the city council members to inform their decision. The room had the atmosphere of a courtroom. A judge presided at the front of the room, lawyers made opening and closing statements, and each side could cross-examine expert witnesses. In his opening statement on behalf of Entergy, Guillot lambasted opponents for not backing up their claims that cleaner alternatives could be used instead of the new gas plant. Nationwide, New Orleans is in the unique position of regulating its own municipal utility rather than relying on a state public utility commission. In 2015, the New Orleans Inspector General concluded the council’s approach to regulating Entergy “lacked basic controls to ensure transparency, prevent misconduct, and promote effective decision making,” and it didn’t do enough to represent the interests of residents and small businesses. A big problem, according to the Inspector General, is that the council relies almost entirely on outside consultants, whose findings go “mostly unchecked.” The council’s regulatory office has just four employees, and 96 percent of the council’s $7.2 million regulatory budget for 2013 went to consultants. At the December hearing, those consultants recommended the city council approve the construction of the smaller, $210 million plant — an outcome neither Entergy nor its opponents pushed for. If the utility committee votes Wednesday, the matter will go to the full council. Historically, the city council adopts the recommendations of its consultants.